Growing your own fruit and vegetables is a satisfying way to guarantee that you and your family enjoy healthy produce. Making the most of the space you have available is key to maximizing how much you can grow. Follow our five simple steps to help you grow a productive garden that’s brimming with home-grown goodness. Every productive garden has healthy soil at its heart. Most soils can be greatly improved by adding well-rotted organic matter such as garden compost, or manure from organic farms or other sources where no persistent herbicides have been used. Organic matter is rich in beneficial microbes that make the nutrients contained in soil available to plants’ roots. It also improves soil structure, retaining moisture within quick-draining sandy soils while helping soils that are prone to waterlogging, such as clay, to drain more easily. Add organic matter as you dig your soil before the season starts. If it’s already been dug, or if you practise no-dig gardening, simply leave it on top or use a garden fork to tickle it into the top few inches of the soil, leaving the worms to do the rest of the work for you. Organic matter can also be added around established plants such as fruit trees and bushes, or laid into the bottom of planting holes for very hungry vegetables such as climbing beans or squashes. The secret to getting the most from your plot is careful planning. By setting out what, when and where you want to grow in advance, you can ensure that your soil is rarely left bare and there is always something ready to be harvested. Our Garden Planner offers a time-saving tool for planning your garden. Start by defining your garden’s dimensions, then select and drop into place structures and permanent features such as fences, paths, greenhouses and raised beds – objects can be resized and moved around to accurately reflect your garden’s layout. Use the plant selection bar to select and drag out rows or groups of crops. By taking the time to make a plan you can make sure that every space is filled, leaving little room for weeds and no excuse for unproductive gaps! See our article on How to Plan a Vegetable Garden for more advice. Maximize your harvests by choosing heavy-yielding types of fruits and vegetables, and the most prolific varieties. For example, a row of pole beans will produce many pounds of pods over the growing season, making the most of vertical space and giving a greater yield for that space. 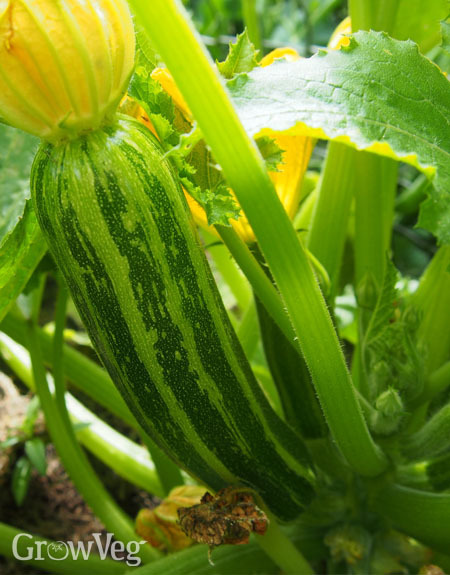 Vegetables such as zucchini , squash and kale are notoriously prolific, while others like radish, salad leaves and spring onion grow so rapidly they can be sown repeatedly throughout the growing season to give several harvests. Fast-growing crops can be planted in succession so that one crop is ready to sow or plant as soon as another has finished. For example, leeks could follow on from early peas, spinach can replace onions, while spring cabbages would be ready to plant after fava beans are finished. It’s easy to plan this in our Garden Planner using the Succession Planting feature. Simply double-click a plant to set its in-ground dates, then view your plan month-by-month so you can quickly see where gaps will appear. Then, using the Custom Filter button, you can choose to show only plants that can be sown or planted during a particular month, so it’s easy to choose what you can grow next. Some crops are especially high yielding. Hybrid varieties may have been bred to resist disease or adverse growing conditions such as drought, or to give bigger, more predictable yields. Other varieties give two uses for the price of one – for example some apples can be eaten straight from the tree or cooked. Productive gardens aren’t just for the summer months. Grow all year round by starting off early-season vegetables within the warmth of a greenhouse, cold frame, or a sunny windowsill. When the weather outside has warmed up the young plants can be planted out, giving you a head start on those sown outdoors. Tender crops such as tomatoes, cucumbers and chilli peppers can be sown weeks ahead so that they’re ready to plant out as soon as the date of the last frost has passed. Our Garden Planner will tell you the best time to sow and plant based on climate data for your area. Outdoors, soil can be warmed in advance of sowing by covering it over with row tunnels, cloches, clear plastic, or horticultural fleece. Position covers at least two weeks beforehand to trap the sun’s warmth long enough to penetrate the top few inches of soil. Keep them in place after sowing to encourage quick germination and a quicker harvest. Covers can also be placed onto established crops at the end of the summer to extend the season, or use them to grow a winter crop of hardy salad leaves. Competition for your crops comes in the form of weeds, pests and diseases that will slow down growth and compromise your garden’s productivity. Keep on top of weeds by hoeing regularly or hand pulling, or use scissors to avoid disturbing the roots of young seedlings. Lay down a mulch of organic matter at least an inch thick to check weed growth, or set weed-suppressing membranes around permanent plants such as fruit trees and bushes. Slug traps filled with beer will help prevent devastation by molluscs. Protect vegetables prone to pigeon damage with netting. Use micromesh or other fine covering to guard against insect pests such as whitefly, caterpillars and carrot fly. Fruit can be grown inside a fruit cage to exclude hungry birds. You can also encourage pest predators into the garden to reduce the need for pesticides while boosting productivity. Do this by providing suitable habitats such as ponds, insect hotels and log or stone piles, and by mixing beneficial insect-attracting flowers such as calendula into your plan. A garden that’s productive is a place of great beauty, and it’s achievable given a combination of planning, dedication – and just a little tender loving care. Please share your own tips or questions by leaving a comment below. "Hi great article I will use it a lot when getting ready to plant this year 2019. Thank you. Regards. Michael Kennedy"
"Thanks Michael - glad you've found it useful. Good luck with your 2019 garden."